Following with the reflections about the phenomenona of corruption and its different approaches, at this time, I made a reading suggestion of an instigating book about political science, written by several Brazilian authors and organized by Leonardo Avritzer. According to the authors, one of the objectives of the book is to provide the reader with a set of references that allows to advance in the understanding of something that is part of the long political history of the West and to resist the unilateral analyzes of its determinations. The book is divided into three sections, each with major topics of analysis that bring a series of essays, seeking to understand corruption, its origins and manifestations, from different perspectives. Thus, section I deals with “political theory and corruption”, presenting in the topic “authors” the respective classics of antiquity (Plato and Aristotle) ​​and modernity (from Machiavelli to Weber). Also in this section, the “political traditions” (liberalism, republicanism, socialism, totalitarianism and democracy) and “conceptual problems” (public sphere, transparency, public interest, among others) are discussed. The starting point, therefore, is the investigation about the thought of authors who have dedicated to study the problem since antiquity. With the modern revolutions and the consolidation of the democratic referential, the theme underwent to a new transformation that combined the concern for the sense of history with the intense debates about the institutional organization of the States. Finally, it addresses some of the conceptual problems inherent in all studies of corruption today, focusing on the separation of public and private. Section II addresses “corruption, history and culture” focusing specifically on Brazil. In the topic “Brazilian history”, the essays deal with the corruption in the country from Brazil Colonia until the period of the military government. In the topic about “culture”, the authors explore the presence and/or preoccupation with the theme of corruption in the literary classics (Machado de Assis), theater, cinema and popular music. These essays aim to present a historical perspective on how corruption emerged and was treated or ignored in the respective periods. The articulation with the aspect of culture seeks to associate corruption with its criticism. “Whether it be formulating types such as the trickster or the corrupt politician, whether it is thematizing situations such as official favor or impunity, through irony or protest, joke and ridicule, such artistic repertoires are embedded in an ethos of republican formation of citizens’ awareness”(AVTRIZER et al, 2008, p.18). Section III, on “current issues of corruption”, presents more technical texts dealing with control and the fight against corruption. The first topic addresses “corruption and political systems”. The next topic deals with “institutions and themes”, with essays on police corruption, organized crime, environment, gender, agrarian reform, entrepreneurs and rentier networks, NGOs, smuggling, among other issues that are related to corruption. 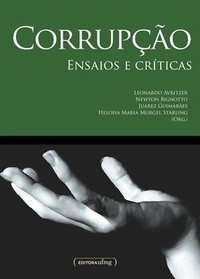 The last topic of the book deals with “control of corruption”, whose essays mainly address the role of Brazilian and international bodies in the investigation, denunciation, control, punishment and measurement of perception on corruption in Brazil and in the world. This part of the book seeks to offer the reader an understanding of the institutional framework for fighting corruption in Brazil. According to the authors, from the point of view of the institutional treatment of corruption, the country has made significant progress. But from the point of view of the citizen’s perception, Brazil faces a dilemma: the more corruption is tackled, the more it is reported and the greater its perception. (This subject will also be the subject of my next essay on this blog: measuring/perceiving corruption in different countries.) The book offers 600 pages of a flowing reading. It emphasizes the creativity in the choice of themes, as well as its importance for Brazilians in general and for scholars of the subject, especially in this electoral year. The clarity and quality of writing also facilitate the understanding of the essays by the most diverse audiences. Reference: AVRITZER, Leonardo et al. Corrupção: ensaios e críticas. Belo Horizonte: UFMG, 2008.